It’s now just under 18 months since I took over as the Society’s Director. If you had asked me at any point in my 12 years at the Society if I was busy I would have said ‘yes, very’ but I have never been so relentlessly busy with seemingly ‘urgent’ business as I have been in the last year or so, and time has flown by as a result. The lack of activity on this page in recent months is testimony to this! 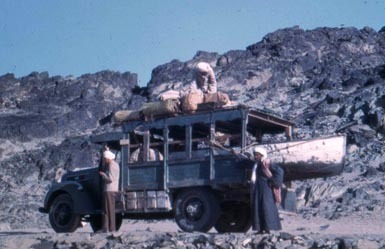 The vehicle used by the Society during its excavations at Amara West in the years following the second world war. Doing a great job but in need of renewal – a little like the Society today? Much of the ‘urgency’ stems from our desire to maintain momentum as we try to bring about significant changes to the way the Society operates, and much of this work is taking place ‘under the bonnet’. I have come to think of the Society as being a little bit like a car in recent years: it was running smoothly enough for a while (pre-British Academy grant), it then ran out of petrol (withdrawal of the British Academy grant), we got it going again with a hefty push from a friend (our members) and the petrol can in the boot (the Excavation Fund and other reserves), and tuned the engine up to get it running a little faster (improving things in areas such as events, communications, fundraising, archives), but now that we want to make sure it can continue to run efficiently for many years to come we need to get under the bonnet, and make a few more changes which, though substantial, will not be immediately obvious from the outside. Change can be hard: in an organisation like the EES in which so many people are involved and whose work and aims inspire such passionate devotion, it is too much to ask that everyone reach the same conclusion about where the organisation should be, all at the same time. Change, in our case, is a journey, and bringing everyone with us requires patience and above all effective communication internally (I have also discussed this before, here). We are, of course, having to maintain ’business as usual’ while working to bring about this change. The reviewing, rethinking, unpicking and rebuilding required takes lots of time and energy and we have to do this while continuing to deliver the very full programme of fieldwork, research, publication, and events that our members and others have come to expect. 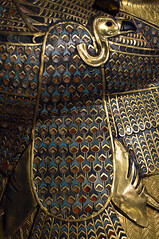 Moreover, we have had to do all this while our financial position has been much more difficult following the withdrawal of the British Academy grant, and in fact our first reaction to this was to redouble our efforts, expanding our activities in certain areas, especially publication, communication online, events and in cataloging and conserving our archival collection (see my thoughts on the work we have done in this area, here). As a result we have set ourselves some pretty high standards. An edited version of the following paragraphs first appeared in Egyptian Archaeology 42 (Spring 2013). This was a summary of my presentation to the Society’s membership at the AGM in December 2012 which, although it took place just under a year after I took over as Director, mainly concerned the year ending 31 March 2012, just a few weeks after my term of office began. My intention was not only to report on the year’s work but to put our activities over the last few years into context, and to show how things have been changing for some time. This was important to me from a personal point of view: in some ways I was setting the scene at the point I took over as Director, at a time when my colleagues and I were beginning to consider how to bring about the next wave of changes. The Society’s AGM in December 2012 took on a slightly different feel from the meetings of the past. Following the revision of the Society’s Memorandum and Articles of Association the year before the meeting was chaired not by the President as had previously been our practice, but by Dr Aidan Dodson, the current chair of the Board of Trustees. The Chair had previously been the person to deliver the report on the year – 2011-12 in this case – but this role has now been passed to me, as Director. This was my first AGM in the role, and in the months since I took on the post I, along with my colleagues, have given a great deal of thought to where the Society is at present, where it has come from, and where we want it to go. With this in mind I thought it would be useful and appropriate not only to report on the year gone by, but to put that year into the wider context of the last five. The Society has undergone a great deal of change in that time and it seemed the right time to look back at what has happened and what we have achieved. Fortunately, despite the many challenges we have been faced with, the picture is very good. Under the heading of ‘fieldwork and research’, the last five years have been a period of retrenchment and change. Following the initial reduction (2007) and then complete withdrawal of the British Academy grant (2009) expenditure on fieldwork reduced, initially. The black vertical lines in the graph represent the points at which the BA grant was first reduced to 50%, and was then withdrawn completely. The graph shows that expenditure on fieldwork has, necessarily, reduced as a result, but also that restricted funds (in blue) i.e. donations made by members and others specifically for fieldwork, have become much more important at the same time. The loss of the grant forced some unfortunate changes on the Society and made continuing our involvement in fieldwork at two important sites, Amarna and Qasr Ibrim, impossible. 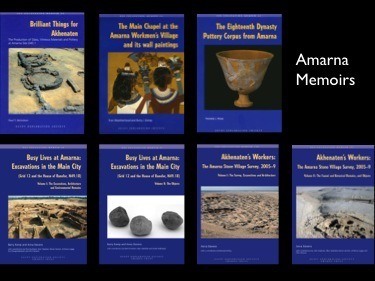 Work has continued at Amarna however under the auspices of a newly created ‘Amarna Trust’ in partnership with which we have continued to produce Excavation Memoirs on work undertaken at the site. 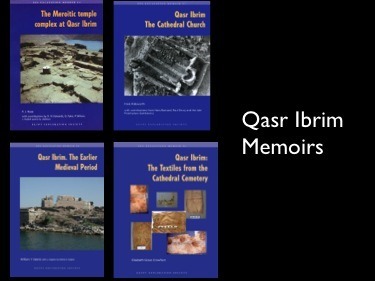 A series of Memoirs on Qasr Ibrim have also been published by the Society during this time. In 2008 and 2009 we took the opportunity to invest small grants in external projects as a means of extending our support for cutting edge work without committing ourselves in the longer term. This allowed us to associate with one site, Ismant El-Kharab, that was entirely new to the EES, and to further our support for work at a series of sites the Society has investigated in the past including Amarna (The Panehsy Church Project), Sesebi and Tell Basta. The existing project at the latter site has subsequently been adopted by the Society as one of its own and was among the EES projects which worked in Egypt during 2011-12, alongside those at at Kom El-Daba, Luxor, Memphis, Quesna, Sais and Tell Mutubis. When considering the initial reduction in expenditure on excavation and survey etc. we must remember that what is important is not the fieldwork itself but the results it brings. With that in mind we can especially pleased with the investment made in publication in the recent years. 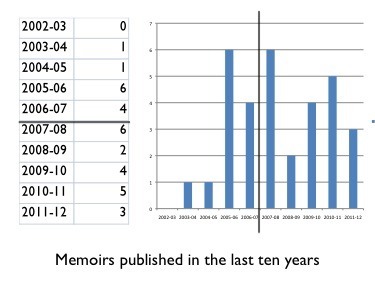 Along with continuing to produce JEA and EA on an annual and twice-yearly basis respectively, we have produced many more Excavation Memoirs and other site reports in the last five years than we had previously: 20 in 2007-12 compared with 12 in 2002-07. 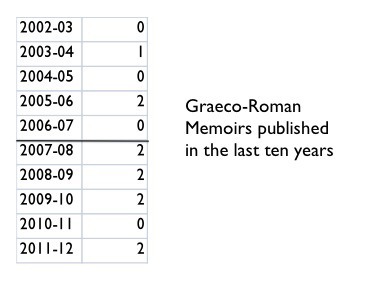 Furthermore eight Graeco-Roman Memoirs were produced in the last five years, compared with 3 in the five years previous to that. In addition we are now providing much more in the way of short articles and photos in print via the revamped EES Newsletter, but also online, where we have made more photos available than ever before along with our first videos. Our extensive use of social networks such as Twitter and Facebook is helping us to bring this content to audiences who would otherwise never come across the Society and its work. Our events programme has expanded dramatically in the last five years, and we have given more attention to the invaluable collections in the Lucy Gura Archive than ever before. I discussed both these areas of our activity in previous posts here (archive) and here (events) respectively. We have also substantially increased our investment in fundraising in recent years, for obvious reasons, and the annual campaign has, since the first was launched in 2008, been a crucial source of additional income for various field and other research initiatives including many of those described above. 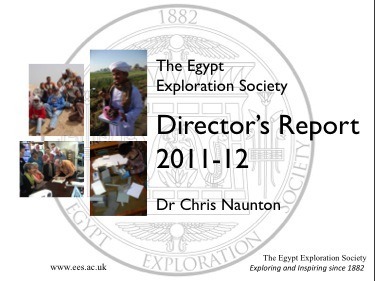 In summary, following the initial reduction in field expenditure, we have continued to maintain and develop our presence in Egypt, seeking out and creating new partnerships and placing renewed emphasis on bringing past work to fruition through publication. 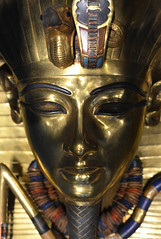 (I am in Cairo as I write this and hoping to something about progress in this area very shortly!). We have also sought new sources of funding, to create new funding models and to rebuild our field research programme, by collaborating with other institutions and bringing new, lower-cost field projects under the Society’s wing. In the next few years we aim to align all our activities more closely to the current strategy for engaging our various audiences. A new Fieldwork and Research Committee has recently been created to develop a strategy that allows us to have the biggest impact in terms of new scientific information, but which is also sufficiently fascinating for a wider audience. 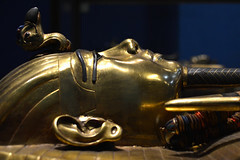 We also aim to develop a dissemination strategy that allows us to make accessible all of the scientific info already gathered in the past for the good of the scientific community– to make good on the obligations relating to past work but which also puts that work into context so that its significance for a wider audience is clear. It’s been an exciting journey over the last few years and it’s not finished yet! As I hope the above makes clear we have, in recent years, striven to make as much progress in modernising the organisation as possible while maintaining and improving our existing programme. Certain aspects of our work were simply too big for us to make much headway until recently however. The internal communication I refer to above, if effective, allows for a consensus view to be reached on important issues but this does not do away with the need for difficult decisions to be made and this requires effective leadership and clarity as to where responsibilities start and stop. The changes at the very top level within the Society – the composition and role of the Board of Trustees, especially vis à vis the Director and other staff – have been essential in providing both. The Society’s governance structure was subject to a long process of evolution over a number of years concluding with a final revision of the Society’s Memorandum and Articles – the governing document by which we are legally accountable – which was approved by the membership a the AGM in December 2011. The revision of the role of Director at the time I took the job on with effect from 1 January 2012, was also a part of this. We have been working very hard in recent months to ensure that we have the right staff team in place in London and Cairo to maintain and improve the current programme while also allowing sufficient time to maintain progress in bringing about the bigger changes. A thorough ‘organisational review’ began in earnest in the second half of 2012 and is now almost complete having led to a few changes to the staff team. We have also invested a great deal of time and energy in building processes to allow us to monitor progress, and ensure that our plans can be implemented and that staff can develop in their roles. We have a great team and as a result are very well placed to keep things moving forward in exactly the way we want. In all three cases our aim is to ensure that the resources we have can be used to best effect. This involves reviewing what we are doing at present, asking ourselves what needs to be done, what is it that can most usefully be done and will bring about the greatest benefits, and then in due course identifying priorities, making the necessary decisions, and, probably, rebuilding. I had two main aims in writing this post: the first was to provide the context to what is going on at the moment, and secondly to provide an idea of what is going on and to emphasize that even if it doesn’t look like much is changing, and the results are not apparent for a while, change really is underway. ‘Urgent’ business notwithstanding, I will try to keep you all informed!